My father Terrel and mother Charlotte Taylor and son Jacob. 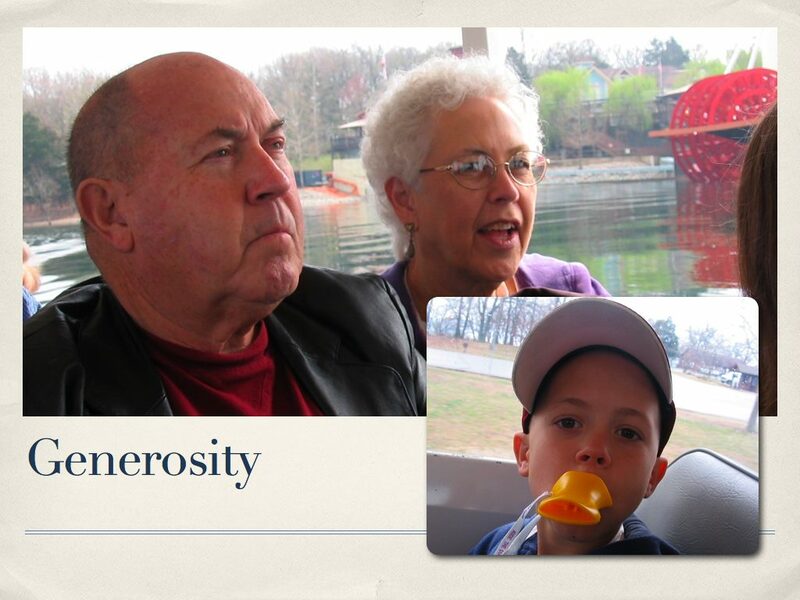 I believe Jesus Christ has given my father and my son the Spiritual Gift of Generosity. Don’t know how it skipped a generation, but I see the same qualities in my dad and son and I attribute this extraordinary generosity to the Holy Spirit. I’ve grown up seeing my dad give away cars to missionaries, jobs to the homeless and destitute, allow people to live in his rental properties, and even in my parents’ home. Now I’m watching Jacob grow up with this same kind of bent toward giving away what he has to others generously. Like my dad, he manages his money and gives it away when needs arise. After the earthquake in Haiti, with no prompting from me or Jill, Jacob gave money to Red Cross for relief efforts. He regularly shows willingness to give freely, and I believe God will continue to use him and this gift. In a recent sermon on Spiritual Gifts I addressed the children and their Spiritual Gifts, assuring them that God’s Spirit blows where it wants, and if he wants to gift you before baptism, he can come upon and gift anyone he very wells wants to. 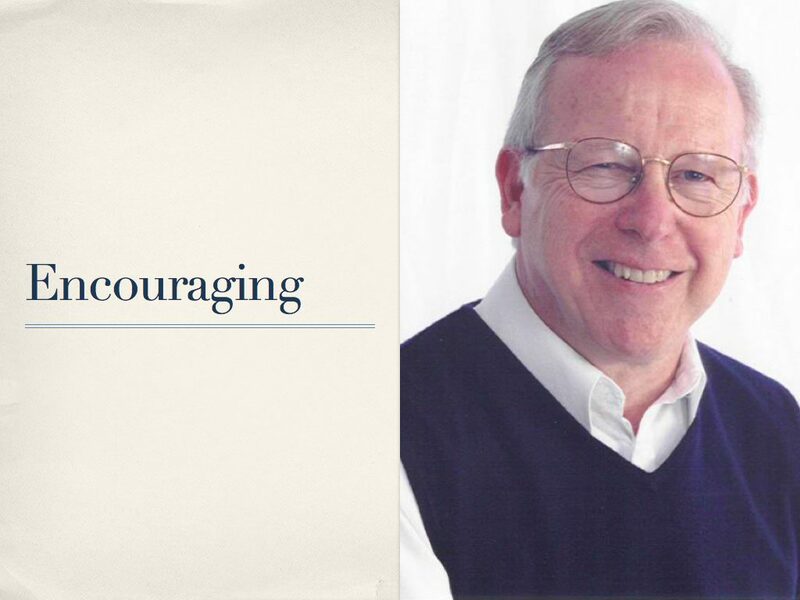 I believe Jesus Christ gave my friend Terry Smith has the Spiritual Gift of Encouraging. This is a seriously needed gift in a world where people find themselves in messes constantly. If I found myself lying on the ground and had committed the worst sin I’d ever done, I would like to see one of a couple people looking down at me while I lay on the ground: Jesus or Terry Smith. That’s how important this gift of encouraging is. Encouraging is the gift of taking someone like the woman at the well who was not truly living and give her living water. Encouraging is the gift of meeting a sinner where he is and saying, “Where are your accusers? Go and leave your life of sin.” When an encourager like Terry says this, you leave feeling that you have not been judged but loved. Loved with unconditional love that is a picture of what God’s love is and does in us all. I want to invite you to come see me at the Kibo Group display at the Tulsa Soul-Winning Workshop Thursday, 2 pm. I’ll be signing books and hosting another author who will be signing as well, Phil Smith. Phil Smith is author of the phenomenal book, The Poor Will Be Glad. The book is a call for Christians to stop living so luxuriously and give our wealth to the poor. Since 2002 Phil has been focusing on doing good works that God has prepared in advance for him to do, according to Ephesians 2:8-10. He has been president of two large companies but now spends his time as a philanthropist and proponent for micro-loans. He also wrote a book called A Billion Bootstraps. He believes some of the charity that’s done abroad does more harm than good and we ought to focus on job creation, business development, and micro-loans, among other things. I would like to introduce you to him. Come out and see us at 2 pm, Thursday, March 24, 2010. That’s 16 years to the day when we landed in Entebbe, Uganda. Others I want you to meet at the Kibo display are Terri Taylor, my sister who lived and worked in Uganda and is an enthusiastic supporter of women in Uganda. She will be offering Ugandan beads for sale and will also have my book, High Places, for purchase. All proceeds go to Kibo Group. I want you also to meet a guest from Uganda who will be at the workshop: Roy Mwesigwa. Roy was our first language helper and cultural informant and friend in Uganda. We have known him for 16 years and we love and respect Roy very much and so glad he’s coming to see us. We’d love for you to meet him. 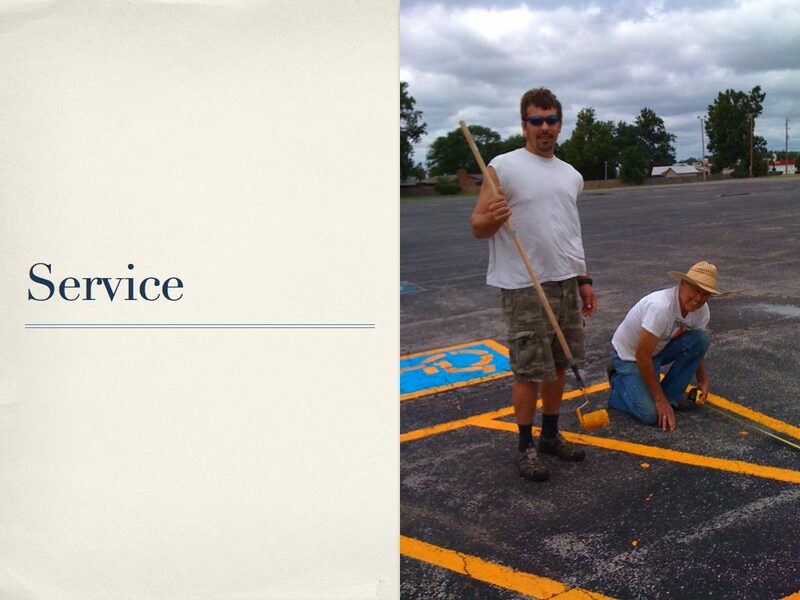 Gene Rogers and Bob Schweikhard paint handicap parking spots in the parking lot at Green Country Event Center, our Garnett Church of Christ meeting place. My friend Gene Rogers has the gift of service. Bob Schweikhard, a long-time servant at Garnett Church of Christ, has been mentoring Gene for the last year. They’ve done tons of projects together and get a lot done both around the Green Country Event Center facility, for church members, and neighbors. I truly believe Christ has gifted these two men with the Spiritual Gift of Service. Listening to Dan Threlkeld who says the snow storm is weakening. We’re going to stick with worship at 10 am at Garnett. But classes canceled to give more time for warm up, arrival and prep of sidewalks. Worship only at 10 am is the call right now as of Saturday night. No classes at 9 am.